Easy-to-care-for and great for beginners, this Chinese Elm bonsai would make a great Father's Day gift, or even a birthday gift for him. The Chinese Elm bonsai tree has small green foliage with serrated edges and well-proportioned branches, making it a delightful, living ornament. Complete with a drip tray and free care instructions, this bonsai tree is great for indoor gardening and fun to look after, and is an ideal gift for your dad. With a blue spotty heart tag, blue jute and blue spotty ribbon, this bonsai is a great way to give your dad a special, unique gift to show him how much he means. Making your gift even more special and personal is easy - you can add a free gift message below, or select some gift wrap from our wide range of options. You can also purchase a charming plaque label for to go on the pot. Free delivery to most of the UK, including free next day delivery. Beautiful Father's Day Bonsai Tree Gift. 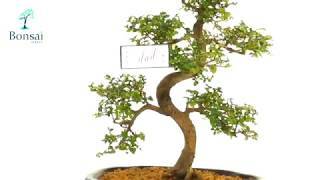 • A beautiful twiggy Chinese Elm bonsai tree with a twisty S-shaped trunk. This fantastic special offer Chinese Elm has a lovely twisty trunk and great character.